Go4Hosting Review 2019: Is Go4Hosting a Good Hosting? Go4Hosting has offered a full range of hosting services since 2000. Customer service is somewhat sales-orientated, but the affordable plans have generous resource allocations. Go4Hosting has been providing website hosting since the year 2000 and currently serves more than 10,000 customers. It owns its own Tier III data center in India, as well as colocating servers in the U.S.A.
Go4Hosting’s website is in English. The shared hosting plans have high resource allocations including unlimited domains (excluding the base plan), disk space, bandwidth, email accounts, and databases. These unlimited allowances are subject to the usual caveats about “fair usage,” of course. You get a choice of Windows or Linux shared hosting plans, along with an extensive range of other hosting options including VPS, cloud hosting, CMS hosting, hybrid hosting, SSD hosting, and dedicated server rentals. All the usual features you would expect are present, such as FTP access, PHP, and MySQL, plus (for Windows plans) Microsoft SQL databases, ASP, ASP.NET, and AJAX. I couldn’t confirm with customer services any support for additional programming languages such as Java, Python or Ruby on Rails. The fact that Go4Hosting has its own Indian data center should mean rapid response times to technical issues and less chance of shared resources being oversold. The fact that this is a Tier III data center should mean less than 1.6 hours of downtime per year. Consequently, this provider’s hosting packages are backed by a good 99.95% uptime SLA. Plan prices are in line with other hosting providers, if not a little lower, and are good value when you consider that most of the resources are unlimited. But consider that domain names and SSL certificates cost extra. Payment terms range from one year to three years, with a discount for purchasing a longer-term plan up front. If I’m being honest, I found the checkout process to be a little bit buggy. 24/7 customer service can be contacted by email, live chat, or telephone. There are offices in multiple Indian locations, as well as in the U.K. and the U.S., and the website contains a good selection of how-to guides to help you support yourself. My experience with customer service was a little unusual. 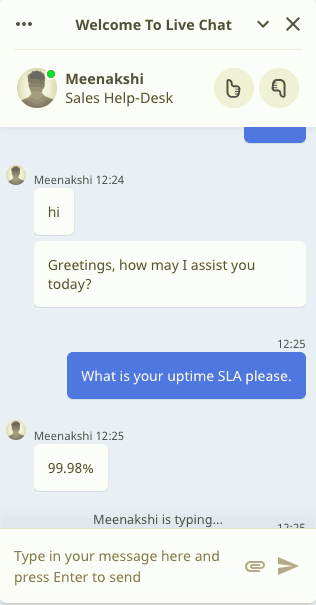 After talking for a while on live chat at around lunchtime (U.K. time) on a weekday, the operator stopped answering my questions and kept asking me to give details about myself. I wasn’t sure whether to interpret this as a sales technique (to get my contact details) or simply as a way to qualify me as a genuinely interested prospective customer, but – either way – it left me without answers to some of my questions. A good thing about Go4Hosting is its ISO-certified Tier III data centers. A not-so-good thing is my experience of sales-oriented customer service, but don’t let this dissuade you from going for Go4Hosting’s well-priced, feature-packed hosting plans. For feature-packed Linux or Windows hosting, go to Go4Hosting! Wondering how Go4Hosting stacks up against other Web Hosting companies? Enter any other Web Hosting company and we will give you a side-by-side comparison.